After starting this blog oh so many... days... ago, I found a few serendipitous moments had presented themselves to me... I got to do the Green Lantern Superbowl book on Superbowl Sunday, I got to review the sorta-kinda Deadpool appearance in Superman/Batman on the day of the film release... now, I sit kicking myself that I didn't save my review of the first issue of Angel Love for Valentine's Day (weekend). Oh well, what's done is done... and, hell... Angel Love ain't no one-shot, so why not see what issue #2 has in store for us. Questions from last issue are addressed, Angel had turned down Don's offer of cocaine. She is terribly conflicted as to whether or not to continue seeing the "first guy in months who turns [her] on" due to the fact that "coke turns him on". She confides in her small group of friends, Wendy the space-cadet and Everett the cockroach killer from issue #1. Wendy offers little help, thinking when Angel mentions "coke" she is talking about the soft-drink. Everett, however perhaps more street-smart, advises Angel to steer clear, as a user will find any reason to use. Angel decides to break it off with Don, which is all well and good until Don rings her up. She is powerless to resist Don's invitation to have brunch at Lagalla. Everett attempts to warn her that she isn't thinking clearly, and she really should "stay away from that creep". The discussion becomes contentious, and Angel storms out. We learn a bit more about Everett this issue. He is fleshed out far better than the guy who was paid $10 to kill a potentially pregnant cockroach. Everett is a musician, or at least he is known to have a guitar in his lap from time to time. He also has a girlfriend. She is a rapper, and is none to happy to hear he's been hanging around Angel and Wendy's apartment (earlier we learn that Ev's air-conditioner has gone kaput, and he's just hanging out until it gets fixed). With all of the fun out of the way, we finally join Angel on her brunch-date with Don. As Don's sole personality trait is his cocaine use, he immediately excuses himself to use. Angel confronts him, and tries to gauge just how serious his addiction may be. He claims to just be an occasional user, however, from the way he describes the various enhancements cocaine brings in to his life, Angel sees through what he's saying. To spare herself from falling harder for him, she walks out. Back to the fun! Wendy is playing nurse to a baby bird. We watch her apply hydrogen peroxide to the bird's wound, and grind together a mush consisting of boiled egg, chop meat, and wheat germ (which she luckily happened to have on hand). With Everett's help, they manage to feed the bird. Wendy changes into her nurse outfit, cap and all... and places the injured bird into a bed, that looks as though it were a converted tissue or shoe box. She ties a string and bell to its leg... so it can ring in case of emergency. The Wendy scenes are truly amazing. Wendy is truly the Amazing Character Find of 1986. The fun police... I mean Angel, returns home. She tells Everett he was right, and receives a call from work. Her friend Cindy asks if she can fill in for her that weekend. Angel accepts, and following Cindy's hang-up, stays on the phone pretending that she is talking to Don, to mess with Everett. Everett goes into lecture-mode, Angel looks coyly at the reader and [we are out]. I know I may have been a bit tough on the Angel scenes this issue, and while they did drag a bit, I feel they were necessary. Wendy's silliness would become a touch to saccharine and irritating without cuts to Angel's living-breathing after school special. Angel's character, it seems, is one that may not have much experience asserting herself... looking out for her best interests. She is a transplant into the city, from the much smaller Scranton, Pennsylvania. It is interesting to watch her reactions to what many folks may have perceived city life to be. I grew up in New York City and from an early age we were instructed to fear and expect a few certainties about life in the big city, including drug-use, gangs, and AIDS. If you were to ask a six-year-old me (which is the age I was when this issue was released), I would likely think that all grown-ups (and teenagers for that matter) that I didn't know either used drugs, was in a gang, or had AIDS. They had us so wound up, many of us were scared to even use the school bathrooms for fear of being forced to do cocaine, beaten up by a gang, or injected with AIDS while in there. The Wendy scenes, we silly and fun. They were the perfect distraction from Angel's relationship crisis. I'm glad this series came out when it did, as I'm sure today Wendy would be a "Youtube Superstar" or tattoo-covered selfie-taking cipher. Despite the serious undertones of Angel Love, there is still something of an innocence to behold here. There's fun, colorful delusion to get lost in and enjoy. 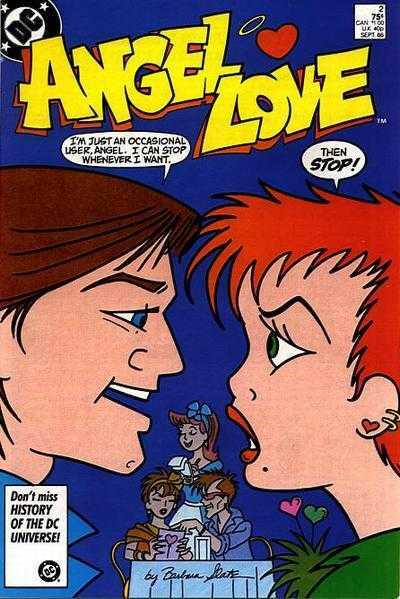 I just checked comixology, and I am absolutely not surprised to see that Angel Love is not among their offerings. This is still a tough one to recommend... on one hand, it is unique, novel, and fun... on the other hand, it's still most definitely not for everyone. I, personally, am enjoying it... though I cannot decide if my enjoyment is predicated on quality or novelty. Ad for the mini-series that changed it all! "Zack Morris is a blonde Tom Cruise..."
"Zack Morris is a ten..."
Hope you read this one with someone you love... Happy Valentine's Weekend!